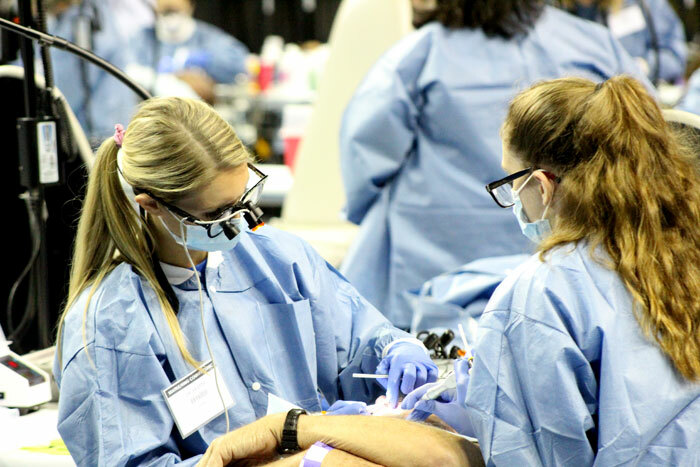 Photos by Brandon Macz: Dental care continued to be one of the most highly sought services during the first day of the Seattle/King County Clinic at KeyArena on Thursday, Sept. 20. About 4,000 people are expected to come through the clinic from Sept. 20-23. A man tries on different glasses frames. About 1,300 glasses were provided during last year's clinic. 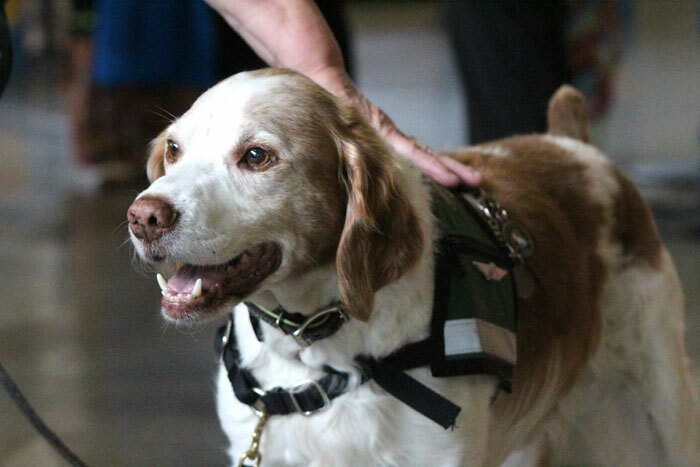 Hope Animal Assisted Crisis Response dogs like Baner will be on hand during the clinic. The Seattle/King County Clinic runs through Sept. 23. The patient waiting area on the roof of Fisher Pavilion opens at 12:30 a.m. each day, and organizers provide people with free admission tickets at 5 a.m. Doors open at 6:30. Free parking is available at the First Avenue North and Mercer Street parking garages. More information is available here. Medical professionals returning to help run the four-day Seattle/King County Clinic were happy to help, but disheartened that the state of healthcare has made the clinic a necessary annual service. 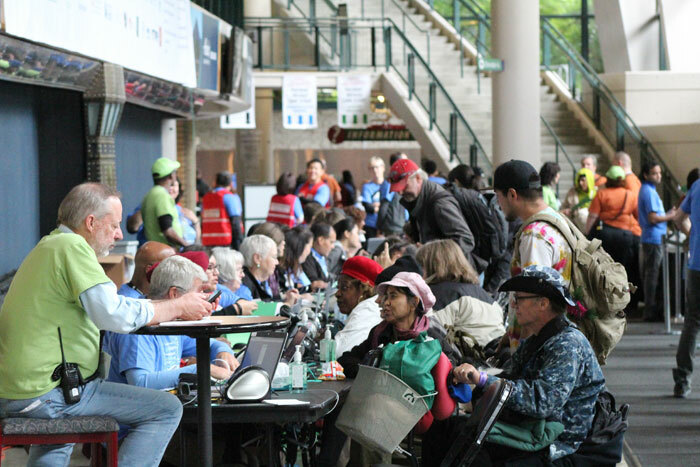 This is the fifth year for the Seattle/King County Clinic, which fills the KeyArena with general support and healthcare volunteers working to meet the medical, dental and vision needs at no cost for more than 4,000 people coming from all across the region. The City of Seattle reports the clinic has cared for more than 11,900 patients and provided $14 million in services since it started in 2014. The patient waiting area opens at 12:30 a.m. each day, and organizers provide people with free admission tickets at 5 a.m. Doors open at 6:30. No one needs to show identification, proof of immigration status, or financial documentation. City statistics for the clinic show that 49 percent of patients in previous years did not have health insurance, 39 percent were unemployed, and more than 60 percent were at or below 200 percent of the federal poverty level. Arnold said he sees more people coming through the doors who are underinsured rather than lacking insurance altogether. They can have a high deductible, no dental coverage, or vision benefits that don’t cover the cost of glasses. 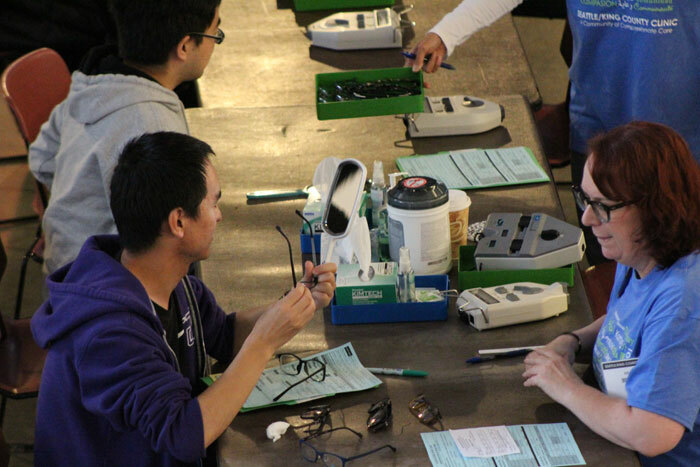 Ophthalmologist Mike Brush said people were set up with about 1,300 pairs of glasses during last year’s Seattle/King County Clinic. People this year have the option of picking their glasses up on Nov. 5, or having them mailed. Of the 4,000 patients expected to come through the clinic during the four-day event, about 1,300 seek out vision care, Brush said. Setup has gotten easier every year since Brush started volunteering in 2015. Brush works for Kaiser Permanente, a major Seattle/King County Clinic healthcare partner, which also sponsors Project Access Northwest. 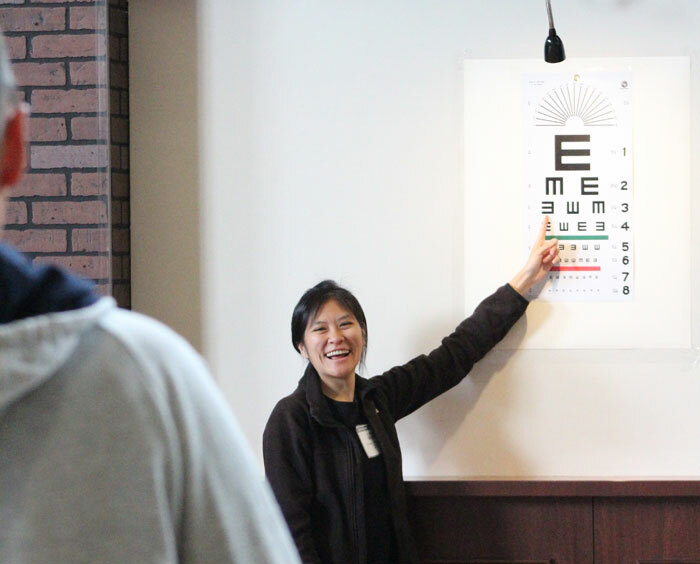 That allows patients coming through the clinic to receive additional treatment through Kaiser, Brush said, adding the healthcare organization provided about 40 cataract surgeries last year. Dental care took up most of the stadium floor of the KeyArena. There were two vans with four chairs where patients could receive root canals, followed by crowns. The clinic provided 613 CEREC crowns from 2014-17. Dental lead Jeff Parrish said the Seattle/King County Clinic goes beyond routine cleanings. Parrish has been volunteering at the clinic since its inception, having been approached by the Washington State Dental Association based on similar clinic work he’d done in New Orleans when Hurricane Katrina struck. The equipment at the dental clinic is rented from the America’s Dentists Care Foundation, Parrish said. He expected more than 2,000 patients to come through the dental side of the clinic this year. Volunteers logged 165,408 hours of time at the clinic in the first four years. A call out usually occurs about five months in advance. With patients speaking 51 different languages, more interpreters are always needed. “Every year we’ll have patients who say, ‘Oh, I want to help tomorrow,’” Parrish said. A $700 million project to renovate the KeyArena could start as early as October, and it’s unclear if a similarly sized facility will be available for the clinic to take place again next year. Arnold doesn’t think so, saying he believes the earliest another clinic could be held again is 2020. “I think that that is a tragedy,” he said.